With the festive season under way and the world facing dark times, what could be better than wandering around the V&A searching for a host of benevolent guardians to keep us safe. And, much as I admire their work, I’m not talking about the security team! The concept of what in modern Britain we know as ‘angels’ is almost as ancient as humanity and features in virtually every civilisation. Winged figures appeared in stone carvings from Old Babylonia at least 2000 years BC (check out the Burney Relief at the British Museum) and have been represented in different forms and with different names and roles across many cultures since then, notably in Christianity, Judaism and Islam, although each has different ideas about what these figures represent. My volunteer colleague Marilyn McIntyre and I have put together an entirely non-academic but (we think!) 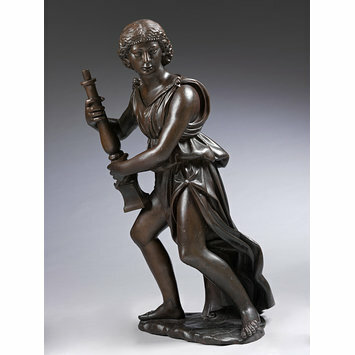 fascinating tour around some of the angels on display in case you find yourself with an hour or so to spare. Follow the Angel 2B icon below and we hope you enjoy exploring with us, whether physically or via the links embedded in this post. Start at the main entrance and take lift B or Stairs A up to British Galleries level 2. 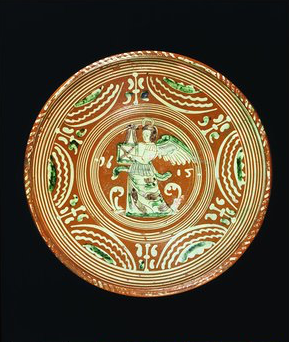 Head to room 56d and in Case 13 you’ll find a lovely German earthenware dish, which helpfully dates itself as 1615. We liked the intricate but naive decoration and rich colouring as well as the benevolent features of the central angel figure. 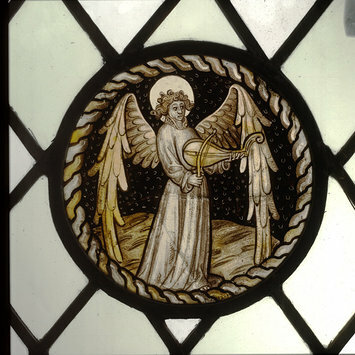 Head through the British Galleries to room 58b, Case 1, where you’ll see a beautiful stained glass panel depicting angels playing a lute and harp. But all is not as it seems. 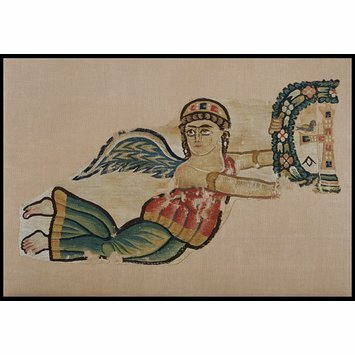 Rather than drawing on divine inspiration, it is thought that the artist had actually referenced performers from one of the touring ‘pageant wagons’, who wore pyjamas covered in feathers as costumes for their popular mystery plays. 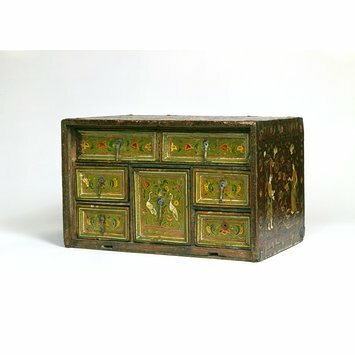 Head back down to the main entrance and into room 41, South Asia, Case 16 to find a stunning Indian cabinet. 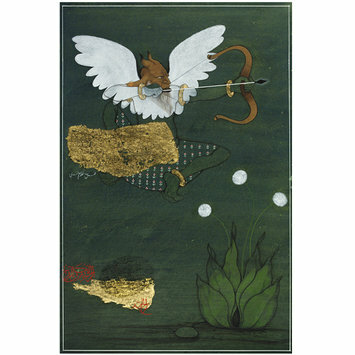 This mixes local craftsmanship with European influences and juxtaposes two subjects that we might not normally associate with each other, namely a gun-toting hunting party on one side and The Annunciation on the other. Now take the main corridor to the Cast Courts, room 46A on the left. 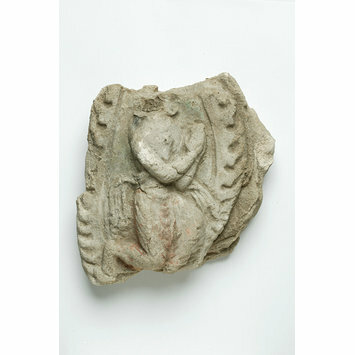 Towards the back of the room beyond Trajan’s column, you’ll see a cast that could, at first glance, appear to be a contemporary piece with African influences. 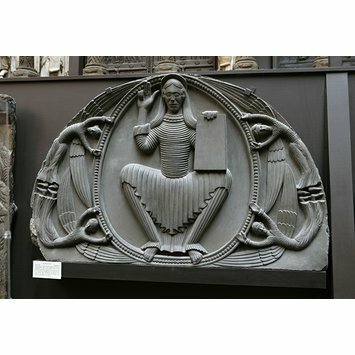 It is in fact a cast of the tympanum from a long-demolished church at Shobdon in Herefordshire and the original highly stylised artwork dates from c1140. Continue through the Cast Court into the exhibition corridor and turn left. Take Staircase L up to Jewellery. Here we have two exquisite pieces to share with you, although there are more to find if you want to linger among the gold and diamonds. 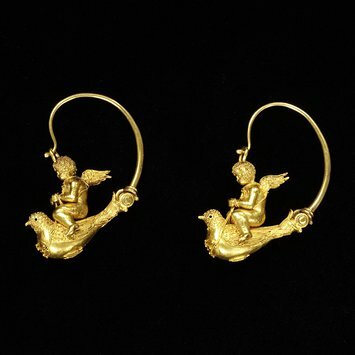 These earrings are an example of how 19th century makers were inspired by ancient pieces discovered during archeological explorations, reminding us that it’s not just in our time that ‘everything is a remix’. The brooch is a modern piece also drawing on ancient teachings for inspiration, producing this beautiful mix of materials and techniques. 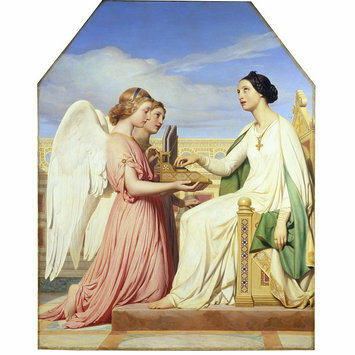 Make your way into Paintings, room 82 and take a look at the East Wall where St Cecilia and the Angels awaits your gaze. 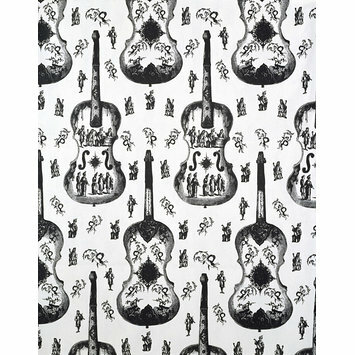 St Cecilia is the patron saint of music so it is fitting that our next angel has a grand piano for company, next door in room 81. 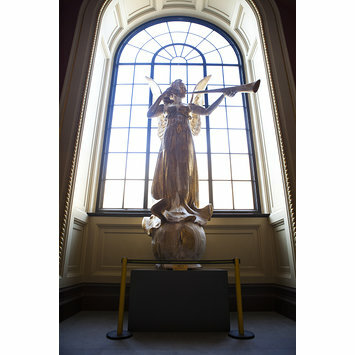 She is the Spirit of Gaiety designed for the dome of the second Gaiety Theatre in London, and erected in 1904. Now make your way into Silver, room 67 and in case 10 you’ll get two angels for the price of one! 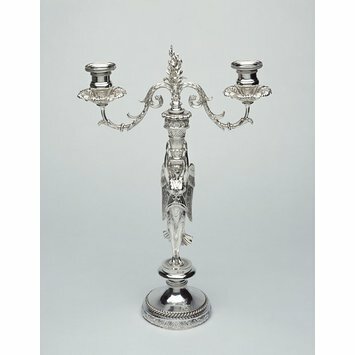 This fine quality silver candelabra is by Joseph Angell who has many other pieces on display nearby. As you head back through Sacred Silver and Stained Glass, room 84, take a moment to seek out this beautifully detailed roundel in case S3. Head back down staircase L and by now you’ll probably need a cup of tea! 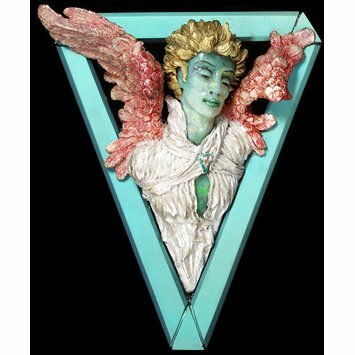 And if you’re in need of some reading material while you rest, here’s a very small selection of ‘angelic’ material to read…sadly these are some of the many items currently in storage but they have diverse and fascinating stories to tell if you click the links. If you’ve emerged from the café refreshed and ready for more, head to the other cast court, room 46B, where you will find an abundance of angels. 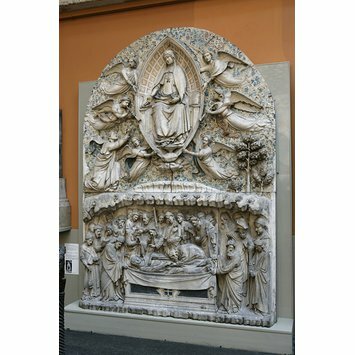 We have picked out The Marriage of the Virgin as a magnificent example with a heavenly host complete with trumpets and all the accoutrements we’d expect in a classical work. 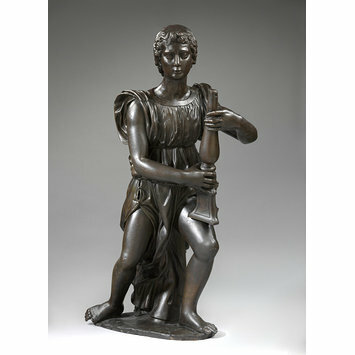 Go out of the Cast Court, cross the corridor into room 50b and look for case 2. 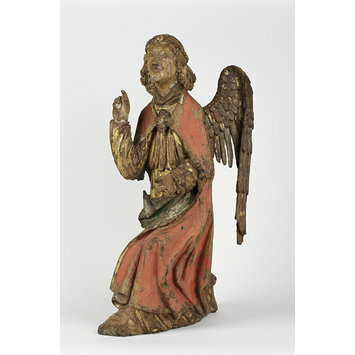 The Angel of the Annunciation is a rare surviving wood sculpture with remarkably colourful decoration given its age. Look around you and you’ll see a host of classical angels but to finish, where else could we end but in room 50a with the two remaining Wolsey Angels. We really hope you’ve enjoyed this tour as much as we enjoyed putting it together! Older entryTetra Classic® Aseptic. Naturally Fun.